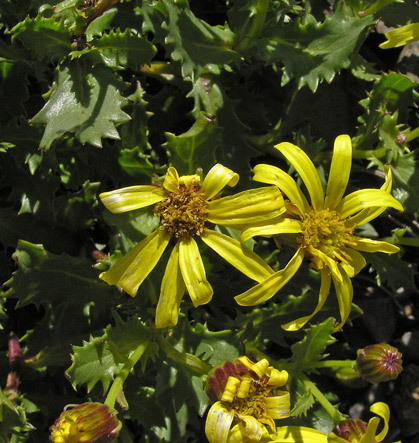 See Senecio atratus for a discussion of the differences between Senecio, Ligularia, and Packera. 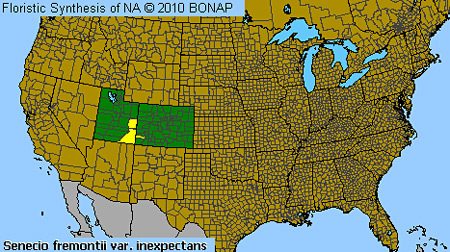 Click for a photograph of the wonderful Colorado location of S. fremontii variety inexpectatus. Subalpine, alpine. Scree, shale, openings. Summer. Sharkstooth Trail, July 30, 2004. This Senecio forms beautifully symmetrical, rounded clusters to several feet in diameter on bare gravel and rock and on scree slopes. 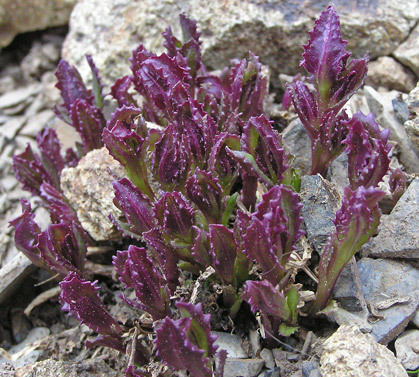 Its thick, succulent-like leaves vary from bright to light green and from coarsely toothed to deeply incised. 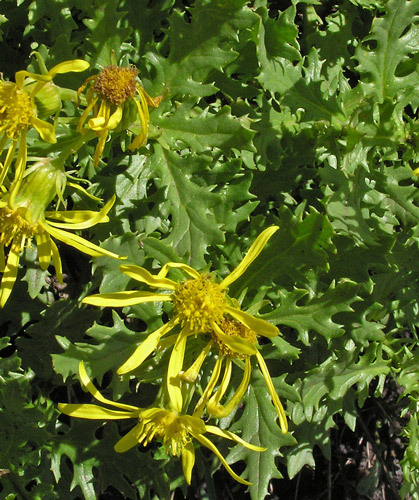 An abundance of bright yellow flowers covers the rounded masses of leaves. 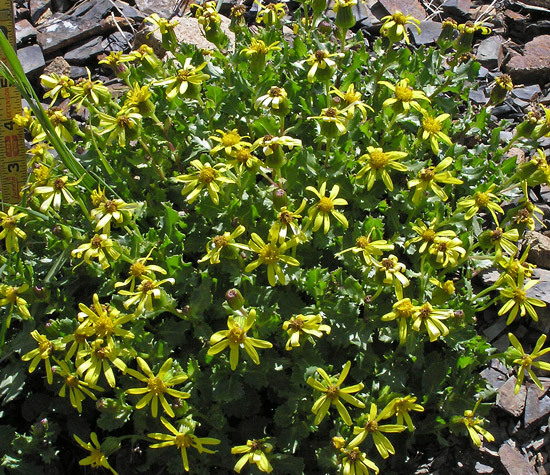 Some alpine trails traverse extensive patches of hundreds of Senecio fremontii plants. 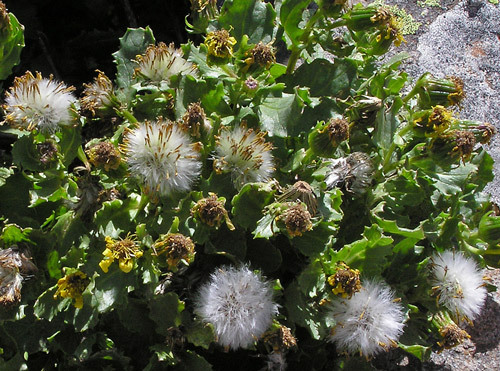 Since Senecio fremontii is usually above tree-line and often on bare rock, it is quite conspicuous. 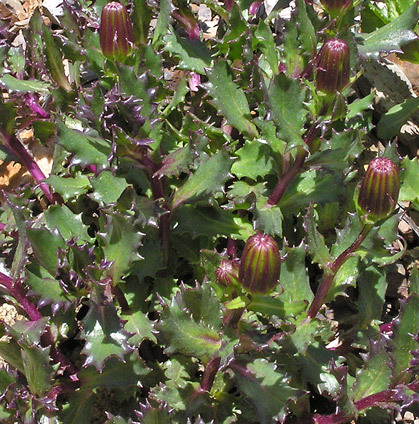 It is often found in the company of the similar appearing Packera werneriifolia. "Senecio" is from the Latin, "senes", "old man", and refers to the pappus hairs, the tiny bristle, hair, or awn growth at the apex of the seeds in Asteraceae. Below Lizard Head, August 8, 2007. 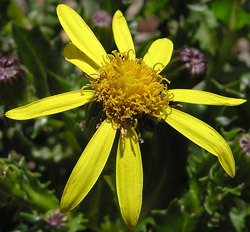 The bottom picture at left shows a new Colorado state record, the rare Senecio fremontii variety inexpectatus, previously known only from the La Sal Mountains of southeast Utah. Leaves of this rare variety are deeply cut, almost to the mid-vein, and often there are sharp teeth. Ray flowers in both varieties vary in width about as much as is shown in the two photographs. Arthur Cronquist, lead author of the Intermountain Flora, named the inexpectatus variety from a specimen that he and Noel Holmgren (also an Intermountain author) collected "along the crest of the ridge leading from Mt. Peale toward Mt. Mellenthin and Mt. Tukuhnkivatz" in the La Sal Mountains near Moab July 9, 1961. Cronquist also named S. fremontii variety blitoides in 1955. Click for a photograph of the wonderful Colorado location of S. fremontii variety inexpectatus that Betty and I discovered. 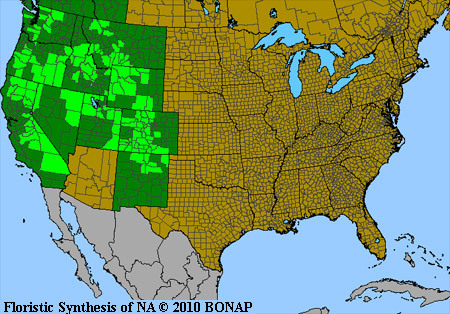 Sharkstooth Trail, June 25, 2008 and July 14, 2006. Young, strongly red-tinged leaves gradually change to green leaves as photosynthesis produces chlorophyll. Then light green and red-tinged buds will unfold to bright yellow flowers. 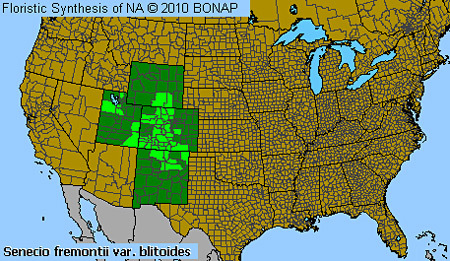 Colorado Trail, September 7, 2007. The white pappus hairs are ready to carry the seeds on the first strong winds.